Concrete is also quite versatile. A simple finish can provide you with the benefits of its durability. 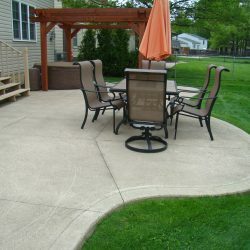 Or choose a decorative option to give your patio or walkway a unique and distinguished appearance and durability. 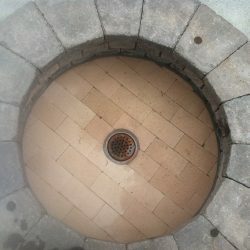 Cobblestones, bricks or pavers can be used. They are all more costly than concrete. All of these options tend to pop or sink leading to a surface that is not level due to the climate in Northeast Ohio. During the snowy winter they can make it harder to shovel. The space between them becomes a great spot for weeds to grow in warmer weather. 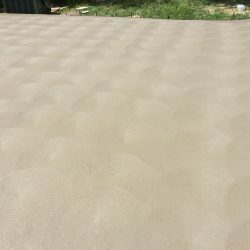 Another option people consider to hide existing concrete is putting a stone overlay on top of the concrete. This material loosens easily and deteriorates quickly when installed over damaged concrete. An overlay also creates height differences that often aren’t taken into consideration before the product is applied. There will be a difference where the new surface meets existing surfaces – like garage floors and driveways. Other downsides are that the overlay material is porous (more likely to stain) and it’s susceptible to chemical damage. 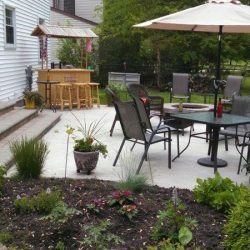 When replacing your existing patio, walkway or steps, planning comes first. You may want, or have to, place the patio, walkway or steps in the same location. Or you may have the option of placing them in a new and better location. When the new patio or walkway is installed it may be a good time to resolve some grading. For your new project you can choose between several standard finishes or decide to add visual appeal by having the concrete stamped and/or colored. If you already know exactly what you want – great! If not, ALBA Contractors Inc.’s courteous staff can provide you with professional guidance with the planning stage. 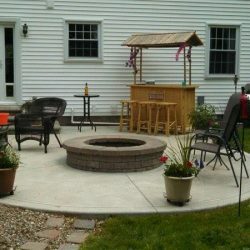 The first step in replacing your existing patio, walkway or steps is demolition of the existing materials. 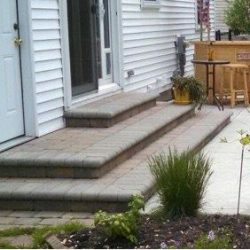 ALBA Contractors Inc. employs a skilled demolition crew who will remove your old patio, walkway or steps quickly and with the least amount of disturbance. All debris will be removed and disposed of properly. The quality of your new concrete is directly related to the use of high quality materials and the skill of the crew. ALBA Contractors Inc. doesn’t cut corners and you’ll see details of that in a moment where quality is explained. The installation of your new project will be done by skilled trade people with the ability and experience to properly perform each step of the process. 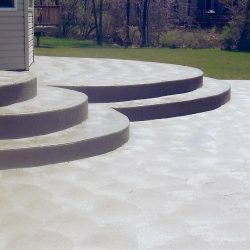 Each step impacts the final quality and durability of your new concrete patio, walkway or steps. 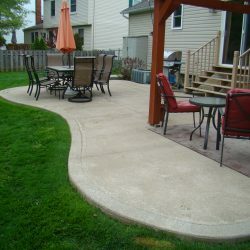 If your project is to install a new patio, walkway or steps then you have many options available to you. Design and planning is an important part of this process, and the trained and courteous professionals of ALBA Contractors Inc. are available to help you. 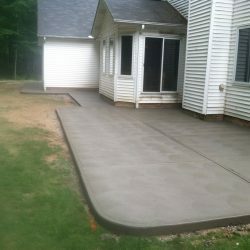 Your new patio, walkway or steps could have a standard finish like a broom finish or hand finish. 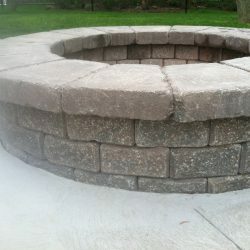 Or you may choose add a decorative finish like stamped and/or colored concrete to enhance the look. With these you can have the decorative appearance, feel, and color of brick, tile, slate, or stone. 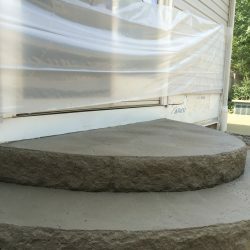 The quality and durability of your new patio, walkway or steps is a direct outcome of the use of high quality materials and the skill of the installation crew. In a moment you’ll see details of how ALBA Contractors Inc. doesn’t cut corners where quality is explained. No one else takes care of you like we do. After the work is complete, ALBA Contractors Inc. will power wash to make sure everything is cleaned up. Whether there’s dirt on your street, house or even your car, we’ll make sure your place is clean. 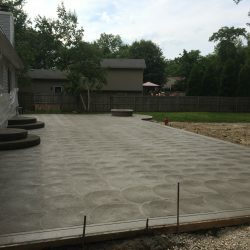 One of the biggest aggravations for homeowners after getting a new patio or walkway is that installers leave a gap between the new concrete and the lawn. In order to install the forms for the new concrete, the adjacent area must be cut back about 4”. This area is usually your lawn. You will not have to deal with the hassle of filling this in or getting someone else to do it – when you choose ALBA Contractors Inc., we’ll take care of this restoration for you, leaving you with a truly completed project! There are a lot of factors that affect the quality of your concrete. 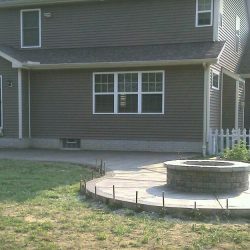 These factors affect not only how your new patio, walkway or steps look when completed but also their lifetime and durability. The right concrete mix is critical to the outcome of your project. 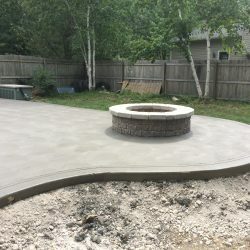 The concrete mix used by ALBA Contractors Inc. is a special mix developed from our 20 years of experience to be the best for use in the climate of the Cleveland area. It’s important to know too that we will not water down the concrete mix to make it cheaper or easier to install. The proper depth of concrete required for your project will be used. Overworking concrete once it’s poured will reduce its strength. Quickly and properly working concrete requires not only skill and training but also the proper tools. The installers of ALBA Contractors Inc. are skilled and trained, and they have the right tools to prevent overworking of the concrete. 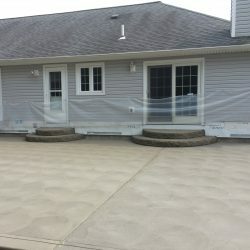 Make sure you’re getting quality when choosing the contractor for your concrete driveway.